I’m either tensing up too much, or it’s singing-cancer (sorry, that’s the way my mind works). I’m sure it’s something I’m doing because it started when I was in a rush to warm up a few weeks ago and I went straight to the high notes. I pushed too hard and too fast and hurt myself. Ever since, after singing for a while I feel pain in my throat whenever I hit the high notes. So, I’m going to start by seeing a vocal coach. If anyone has gone through this, I’d love to hear about your experiences. I know I have a lifetime of bad singing habits to un-do. More #20Acts and #26Acts. Some people do 27 to include Lanza’s mother and some people are even doing 28 to include the shooter because he was a damaged soul as well. Ann Curry who started it all said it was an individual decision. Honestly, I don’t see how one or two more kind acts is a bad thing. 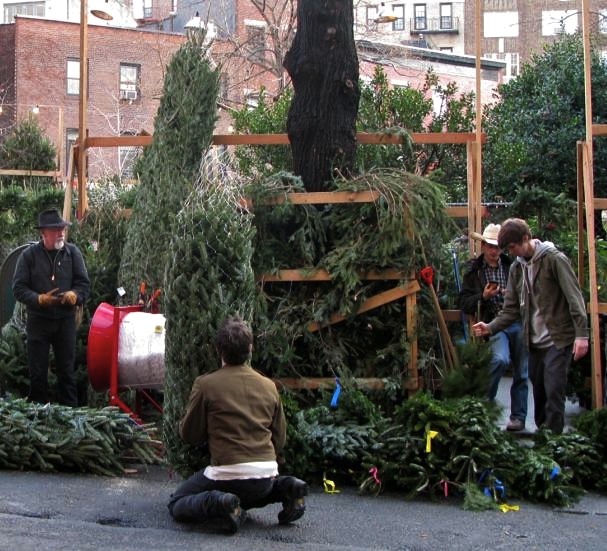 Christmas tree shopping on Jane Street in New York City. I love the what looks to be a cowboy with the iphone. I love your last posts. The true spirit of Christmas and humanity. It is a little sad that we all can’t do that 365 days a year and not just when tragedy hits. If we all try everyday from now on with just 1 act of kindness think of much better our lives would be. One simple thank you or smile goes a long way! I give $25 every month to a different charity or person – whatever catches my eye in the news at the moment. I have another amount deducted out of my paycheck to three causes (Piedmont Land Conservancy, NC Audubon and Carolina Raptor Rehab). I guess I’ll bump it up to $26 in honor of those at Sandy Hook. Like minds must think alike. Nosebleed – nose cancer; bump on my finger – finger cancer. Actually the nosebleeds come from this dry dry weather and the finger bump is due to ganglion cyst. Chapped lips cancer, dry skin cancer, common winter cancers. I love that you give so much to charities. I’m more sporadic. I give when my friends or relatives ask me to support a charity they are supporting, and then here and there to animal rescue organizations. Karen, I agree, you don’t have to do a lot to improve someone else’s day. As I get older and more invisible, for instance, I try to make a point to meet the eyes of the oldest people I see on the street, just to say, I see you. I smile if it feels right.